Shop owners in Jersey face a very tough 2011, the president of the Chamber of Commerce has said. Ray Shead said there will be less money around, plus a rise in the Goods and Services Tax (GST), which will make the year ahead difficult for retailers. Shops will need to become more competitive, and good customer service could make the difference, he said. But shop trade had improved this Christmas after a slow start because of the weather, Mr Shead added. And the post-Christmas sales should also give shop takings a boost. Mr Shead said Jersey's town centre had been very busy on the first day of the sales, with clothes and homeware the most popular items to buy discounted. 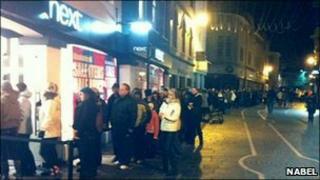 Next clothes shop in Queen Street said 300 people were queued outside when it opened at 0500 GMT on Monday.